BEACHFRONT and affordable. Coopers Beach Retreat- "Tui Cottage" is a modern, comfortable beachfront bach, with its own beach access. Private and quiet it is north facing with all day sun. 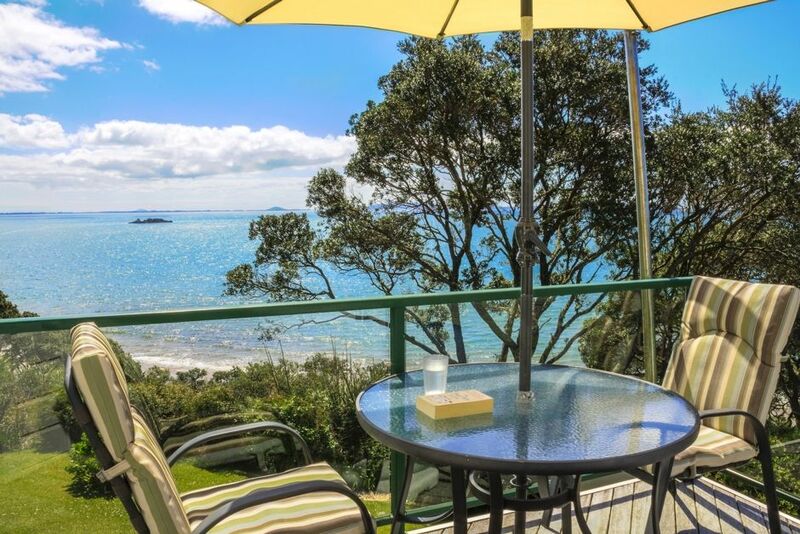 Sit back, relax and enjoy spectacular panoramic views across gardens to the beach and Doubtless Bay. Well appointed and fully furnished, self-contained with own BBQ area. Set on private 1/2 acre. Safe swimming beach which is also excellent for all water sports, diving, fishing,canoeing. 15 minutes from 18-hole golf course. A minutes drive to shopping centre or short walk along the beach. Ideal honeymoon destination. Escape the madness of city life and relax in peace and privacy. Enjoy the luxury of watching the everchanging mood of the sea and sky, the peace and tranquillity of this pohutukawa tree-lined beach. "We stayed at Tui Cottage and liked it very much. We are German and travel to New Zealand often, but this place is truly outstanding! We enjoyed sitting on the beautiful deck and looking out to sea. Just a short stroll through a beautiful flowered garden directly to the beach. Inside was beautifully furnished and very clean, it felt like home. Thanks to Sue and Hugh, who are very friendly. We will definitely be back!!" Pets welcome by prior arrangement, phone (09) 4060696. Extra 1 off charge of $35. Beachfront with path to the beach from the front lawn. Towels provided except beach towels. Please ask if required. Great hosts ! Loved my two week stay would visit again. Kitchen was stove small oven fridge. Gas Bbq provided. Nice deck off living area. Close access to beach down steepish stairs. Not handicapped accessable. Definitely would recommend. The location is beautiful. The Bach has everything you need and is the cleanest holiday home we have ever stayed in. Sue is a lovely host. We highly recommend this property.